If you are not dying to play Nintendo’s Pokemon Go right now then you should seek some sort of help. 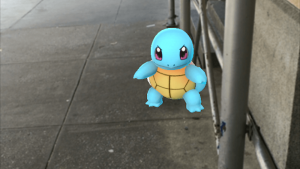 Pokemon Go, which is Nintendo’s first major release in the Augmented Reality (AR) market, is making waves in the gaming community around the world. And who can blame them? It’s not everyday you get to see your favorite Pokemon out in the real world just waiting for you to capture them. Train them and make them stronger. Anyway, Pokemon is currently available for Apple devices and Android devices of all sorts. Though that doesn’t mean if you own an Android phone or an iPhone for that matter, you’ll be able to play Pokemon Go, as it has only been officially released in Australia, New Zealand, and the US. Pokemon fans in places such as Britain, Japan and anywhere else in the world will be required to wait a bit more before Nintendo adds other regions of the globe for the launch of their already hit game. If you already have downloaded Pokemon Go then you must check out guides about how to get the best Pokemon out there and other useful tips and tricks. However, because there are so many people who are trying to download the game at the same time, you may not be able to connect to the official Pokemon Go servers just yet. If that is the case with you then check out Pokemon’s Go Server status website to ascertain if a server is available or not. Needless to say, if the server is not available or not stable, then that is probably the reason why you can’t get Pokemon Go on your device. Yet. But conversely, if you are residing in the United States, then you go over to Google Play Store and download Pokemon Go right now as it has been officially launched inside the US for Android and iOS devices. By now, you might be wondering, why on earth am I reading this guide if it isn’t going to tell me how to download Pokemon Go on my device and start playing it. You may also be asking if you’re just wasting your time since you don’t live in the US so maybe, this guide doesn’t have much to offer you. Well, you are wrong because there is a way to download Pokemon Go on your device regardless of your location or region. That’s right. You can play Pokemon Go, almost right now on your device even if it isn’t officially available in your region. So get ready, because now we will demonstrate how easily you can download Pokemon Go on your mobile device and join your Pokemon Go friends all over the world. You need to know two things right now. First, if your current location is the one where Pokemon Go has been officially launched or not. Second, you actually want to play Pokemon Go. Okay, the second one may not be a question, but it could be if you’re a parent and want to install it for your kids rather than yourself. Regardless, you can follow this guide with relative ease. Remember, if Google Play Store doesn’t allow you (or doesn’t have) to install Pokemon Go, then that is a sign that Pokemon Go isn’t available in your country. So what we are going to do now is to show you instructions on how to download the game from a third party software and then play in on your device of choice. Whether it be Android or Apple. Before you can install Pokemon Go APK file (or any APK file for that matter) you need to enable your Android mobile device to let you install applications that aren’t present on Google Play Store. You will also need to do that if you want to run the game after you have installed it. As a word of advice, always be extra careful in turning on this option because it does make your phone just a tiny bit vulnerable as you might install an application or APK file that may be harmful to your device, might slow down your device or might inject a virus into your device. To combat against these risks, you should always install APK files from sources you know are reliable and secure. After that, tap on Security option. Once inside the Security menu, you need to scroll down a bit and stop where you see the option labeled “Unknown Sources”. As you can see for yourself, all this “Unknown sources” option means is that you are now allowing your phone to install applications that are not available on Google Store. If you know where you are downloading your application from, then this shouldn’t be a problem for you. You need to turn this on by tapping on the light green horizontal pill like button over on the right-hand side of the screen. When you tap on the light green horizontal pill on the right side of the screen, it will illuminate a darker green circle on top of the horizontal pill like button. That is when you know for sure that you have turned off the option. Congratulations. Your phone will now be able to accept APK files that are not on Google Play Store. This will allow you to play Pokemon Go game on your Android device (mobile or tablet). Now we come to the business end of the process. You need to install a file that you will download (in a few short sentences later) from a third party website and then you will be able to play your favorite game, that is Pokemon Go. Otherwise, why else would you be willing to through all this trouble? But don’t worry. Believe in yourself. You will get there. Let’s move on with our step number two. From your Android device, you must go to Pokemon Go APK web page and then when you get to that page, you need to tap “Download APK”. Done? Great. Select “OK” when the message, informing you of danger, appears and your Pokemon Go file should download within no time. Now you have the file you need to install Pokemon Go on your Android phone. Swipe you finger from the very top of your Android device screen so that you may be able to see the notification area. You will see a Pokemon Go file within that notification area. Select it and then select “install”. Congratulations!!! You have now installed Pokemon Go on your Android device and can now enjoy the world’s best Augmented Reality video game (well, mine’s Urban Chaos but to each his own). If you though the Android process was difficult then this might take you a bit more time. Worry not. We’re here to help you get your Pokemon Go video game up and running in no time. The process is a little bit different but nothing you can’t handle. Pokemon Go is available through the App Store but even if you can’t seem to get a hold of it in your country, you can follow the instructions given below to download it and then hopefully install it. Playing it wouldn’t hurt either. As with the Android device process, open Setting menu on your Apple device and then look for an option named “Apple ID”. When you get that done then you need to sign out of your Apple ID. Basically, what we are trying to do here is to spoof your Apple device into thinking that it currently is present in an area where you are allowed to download Pokemon Go. Now, all you must do is select your region as either United States or Australia (or New Zealand if you have watched a bit too much Lords of The Ring lately), because only these regions are allowed to download Pokemon Go at the moment. Quickly open up your App Store and search for Pokemon Go. Don’t worry, after the steps we have taken, you should definitely see Pokemon Go in your list of options. However, if it doesn’t show up as a free app to download then choose another app that is free to download and then select the option “Create new Apple ID”. Simple enough right? Thought so. You can go through the process of creating an Apple ID here. However, you need to select “None” in the Billing menu and don’t forget to , as with the Android device, add either the US, Australia or New Zealand address when the process asks you for it. You can easily find a legitimate and appropriate address for any of these regions by a simple Google search. Step 3: Take Your iPhone and Download Pokemon Go on it. This step is the simplest of all steps. All you need to do select Pokemon Go from the menu that you opened up in the previous step and download the game. After you have downloaded the package, you need to install it. You don’t need to worry about playing Pokemon Go with a completely new Apple ID, because once Pokemon Go is released in your region you can easily sign with your older, original, Apple ID and play Pokemon Go with that one. On a side note, you might have to install Pokemon Go again if you do that though. But that isn’t such a bad thing since your progress within the game is saved on the cloud and that means that you’ll be able to play Pokemon Go from exactly the same position as before. Watch the videos below to check out the same process done by people albeit with different websites. Enjoy.